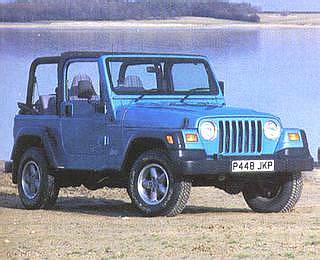 I have a Wrangler Sahara 1997 with the 4.0L six and 5-speed manual transmission. It is fully loaded. Other than the typical rust these Wranglers endure. It drives and runs like new. This Jeep is the best choice for any Mountain Dweller. On and off road this is the absolute best choice. I live in NE Pennsylvania and anyone from this area with these crappy roads can tell you, you need this Jeep. And the cost of ownership is very, very low, especially if you're mechanically inclined. My Jeep was bought new by my late father 16 years ago and I'm driving it today. Can anyone here tell me that a Japanese truck will do that? And I mean be able to pass inspections year after year? And cost less than a carton of cigarettes to fix?